I always hit the classics shelf first. The librarian working in the store was surprised and delighted to find that I was buying the large, ancient tome of Plutarch that she thought nobody read anymore. It’s true that I do have another edition of Plutarch, also the Dryden translation, but it doesn’t contain nearly as many lives. And now we can read it as a family. I also netted a more modern Penguin Classics edition of Plutarch containing just six lives: Sulla, Crass, Cicero, Pompey and Caesar, complete with copious notes. I got nice hardback copies of Milton (Complete Poetry and Selected Prose), Pride and Prejudice, and Far From the Madding Crowd, along with a paperback of Guy de Maupassant’s Bel Ami, which I haven’t read (although I did see the rather silly film adaptation with Edward-the-Vampire in the title role). Also Beowulf, since the kids have been listening to a kid version on Librivox. The drama shelf gave me Rosencrantz & Guildenstern Are Dead, as well as Hamlet, The Tempest, and Much Ado About Nothing in the “No Fear Shakespeare” editions that my homeschool friends are always raving about. I already have at least one Complete Works of Shakespeare as well as each play in adorable pocket-sized hardbacks, but one can never have too much Shakespeare. Poetry was a bit sparse today, but I did net The New Oxford Book of English Light Verse. I’m of course on the lookout for anything to do with Greece these days, and was pleased to find a Collins Pocket Greek Dictionary, although Tony rightly pointed out that one’s pockets would have to be unusually large to accommodate it. Will Durant’s 1939 The Life of Greece (part of his Story of Civilization series) looked promising, as did Edith Hamilton’s Mythology, since I’ve read and loved her previous book, The Greek Way. I don’t typically buy random books I’ve never heard of at book sales, but The War at Troy by Lindsay Clarke sounded interesting, and also Greek, so I popped it into my now nearly overflowing bag. My library usually does not have very much good children’s fiction at book sales, but today I was pleased to find a darling edition of The Wind in the Willows. I already own two copies of this book, but it’s such a lovely book, and the illustrations in this particular copy were so sweet that I couldn’t resist. I also found Madeleine L’Engle’s A Wrinkle in Time, along with its three sequels, all matching. A heavy-duty Childcraft Children’s Dictionary rounded out the kids books, unless you count 100 Heartbeats, which I got for Axa because the author, Jeff Corwin, is her hero, and possibly also her first crush. In a similar vein, we also picked up Among the Great Apes, for more nature-related reading. By this time my bag really was splitting at the seams, but I managed to cram in a final book: Literary Houses, a sort of idiosyncratic old fashioned coffee table book about ten iconic houses in famous literary works, and their real life inspirations, among which Manderly from Rebecca, Satis House from Great Expectations, and Northanger Abbey from Northanger Abbey. I’m seized by a sort of madness when I go to these book sales. 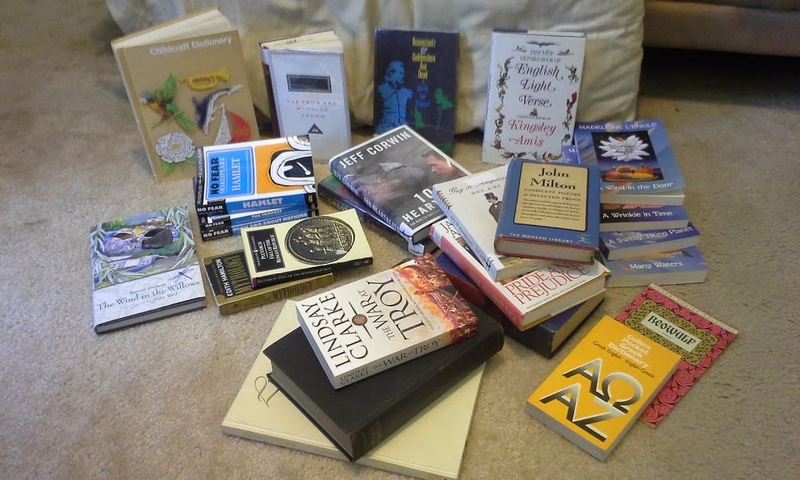 For years, I’ve been collecting books because I knew someday we would move far away from the library, to somewhere where the only books my children would have in their native tongue would be the ones I had collected. That original impetus for my book collecting is still in force–we are indeed moving to a Greek island next year. But the drive to collect books has become something more for me now. I can feel the relevance of good, old fashioned books slipping away. It’s not that I oppose the digitization of books; I love my Kindle and can’t get enough of sites like Gutenburg and Librivox. These days I’m as likely to read a book on my Kindle or listen to it on my phone as read the printed page. Not that I’ve given up the printed page either; I’ve just learned to be omnivorous. I love having a book by my bed, but I love being able to access my whole Kindle library on my smartphone too. I’m all for every book ever written being available online to anyone in the world who wants to read it. But at the same time, I can’t help being affected by the prognostications that printed books and libraries are becoming obsolete, and pretty soon everything will be digitized. I’m not a luddite. I want them all digitized. But I want them as books too, real books that I can touch–the bodies that hold their souls. Here’s hoping. But I’m keeping my own book collection, just in case. I’m glad you found such good books for your collection!